I have been a designer for the last thirty years and after all this time I still love what I do! I have always enjoyed art and design. I majored in interior design at Syracuse University and upon graduation, I worked in a popular furniture store that sold readymade and custom furniture. A friend of mine from a class I had been enrolled in at Parson’s School of Design offered to help me fix my closet. I calculated how many inches of short, long and mid length hanging I had as well as the number of shoes. In my 6 feet by 3 ½ feet deep closet, I created a triple hang, short hanging over mid length, and double-hanging section with a shoe shelf section on the side. Out of the most basic material, my friend executed my design and I increased my space. Who would have ever thought I’d still be doing that for other people and make a living at it this many years later! Being able to enter people’s homes and provide them with beautiful, functional designs has been extremely rewarding work for me. Meeting new people every day, coming into my office and feeling the excitement of a lively environment, being able to go to new homes and communities, as well as being able to work from home has been and still is perfect for my personality. The icing on the cake is seeing how happy my clients are once they see the outcome of projects I help bring to life! I love going into a client’s space and visualizing how I will lay it out in a way that is the most aesthetically appealing. I look for the focal point and that is where I will usually place the most elaborate part of my design. Whether it be a pretty drawer bank in a closet or a stone wall behind a TV in an entertainment center; that first line of vision is where I begin. From there I add in all the other components in an attractive manner while always making sure the clients’ storage needs are met. I always try to add one unique element to each space that I haven’t designed before. Borrowing ideas typically used in one space and incorporating them into other areas adds a surprise factor. For example, I designed a space for hats and accessories out of slat wall which up until then I had only used in garages. The matching wood tone of the closet system helped enhance an otherwise unusable wall. Another example is my frequent use of pull-out caddies, first seen in kitchens, as convenient beautiful accessory holders in closets. Flip up doors which originally debuted in kitchens are fantastic looking in home offices and entertainment centers. 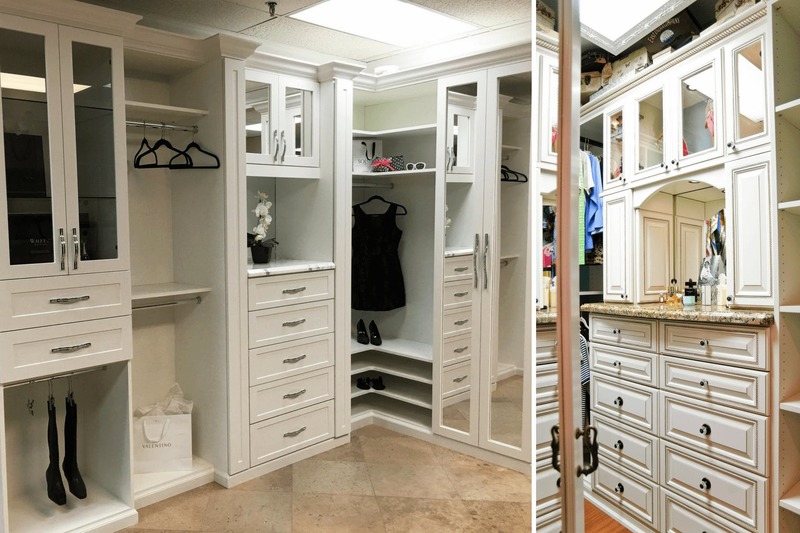 I always try to design a space that helps increase the convenience of use and function of the closet or space while also increasing its visual and physical size. Examples are keeping entrances uncrowded feeling by placing shoes or benches which are less deep than hanging near doorways. When designing an entertainment center or home office I plan for tall cabinets to be on the far side of the room rather than at the entrance allowing for a more open feel. The first thing I think about is how I can improve this space by making it look amazing as well as organized and functional. 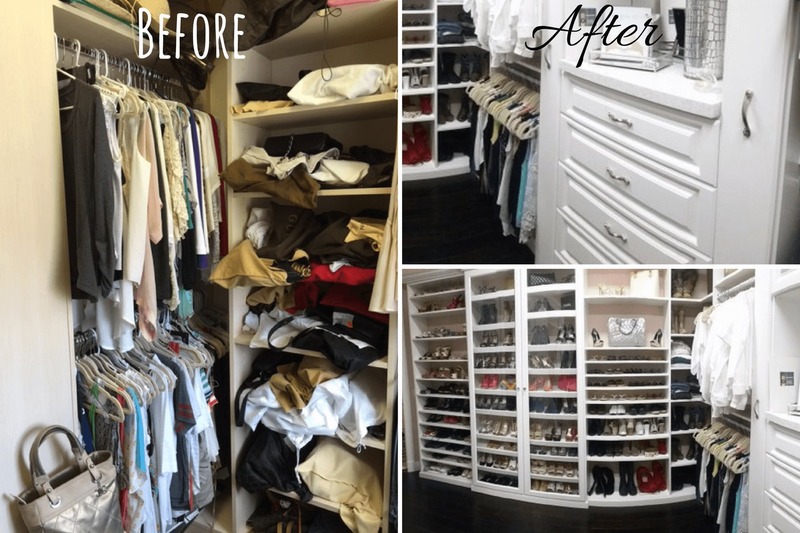 The above picture is of a master bedroom closet for a client who had a peach bleached wood closet system with a peninsula that broke up the closet in a way that did not allow for all of her items to be grouped in an organized manner. I redesigned it with all of her shoes and purses together and a drawer bank flanked with caddies as her focal point. This new layout done in white with raised panel faces gave my client the fresh updated open look she was looking for. 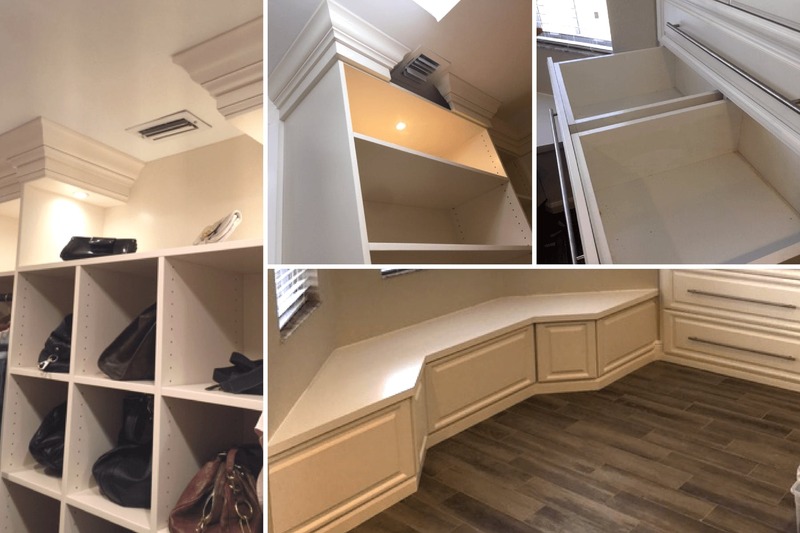 The most difficult obstacle I face in closets is how to build to the ceiling and not obstruct vents if my client doesn’t want to or it isn’t feasible to move them. By planning in advance an attractive solution can be achieved. Angled walls are also a challenge. The banquette below is a good example of how I designed a seating area in a tight space. Also, we matched my client’s kitchen cabinetry with a custom built in the cabinet rather than the inaccessible standard bifold door. pantry Our skilled installers do an amazing job executing my plans. I engage the client by truly taking an interest in their needs and listening to them. By having them participate in the process they feel as if they own the new design and their enthusiasm takes over. I show them lots of pictures and look at pictures they want to show me. This along with bringing them to our showroom helps them in selecting options. It also helps me present a design close to what my clients want and need. 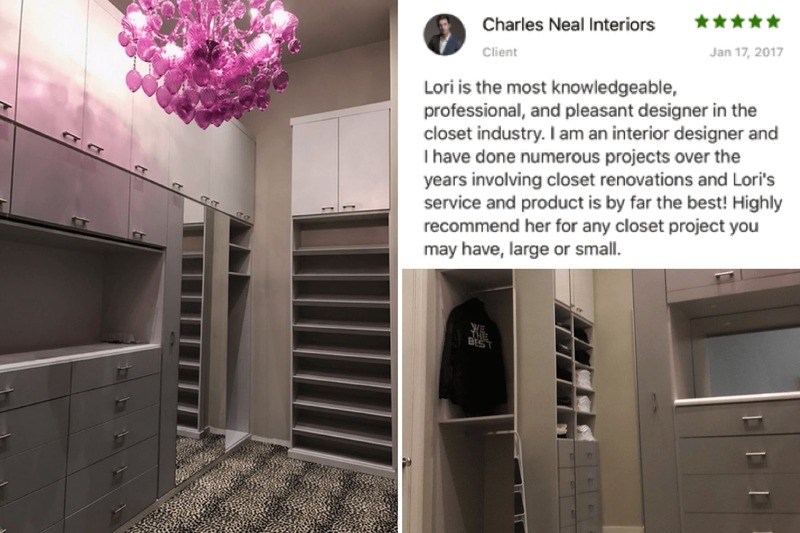 I designed this closet for our showroom and it has provided a launching pad for numerous closets that my fellow designers and I have provided for our clients. This client had a wonderfully eclectic mixture of modern, traditional, and neoclassical details in her home. I picked up on her color scheme and used my favorite glazed thermofoil door style with rope detailing. The layout had to include a display for her porcelain doll collection and her jewelry. 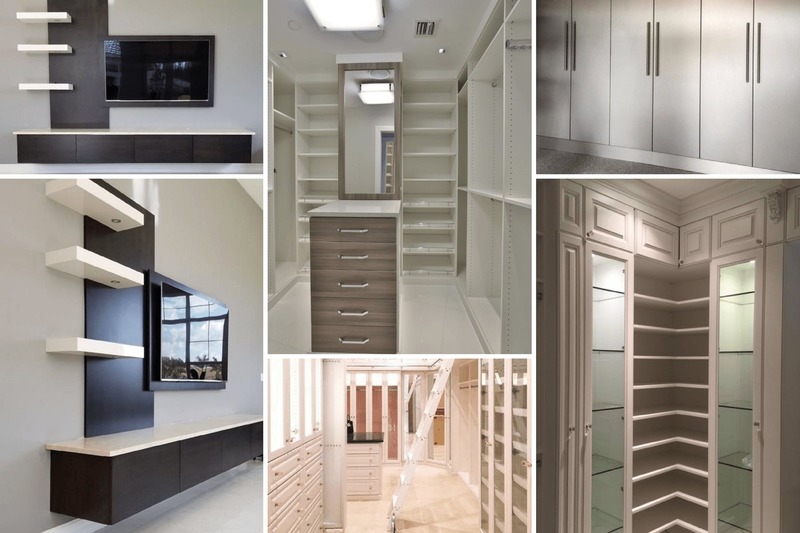 The visual impact realized upon entering the closet by the drawer bank, glazed rope moldings, oiled rubbed bronze hardware and sky blue walls make a huge impression. The first question I ask my clients who call me for a home office is where would they like their desk to face. I always try to honor this request and design around it. An organized home office enables a person to access files, printers, folders, and equipment with ease. Because it is a personal space it is a great place to display memorabilia, art or collectibles. This client had traveled extensively and wanted to display items he had collected from all over the world. He wanted a freestanding desk. Together we selected a wood finish stained to match Hudson cherry which was in line with the color palette of his modern home. Because I love to maximize storage in a beautiful way I often recommend three-way mirrors with shelves or hanging behind the mirrored doors. I am looking for unique ways to add lighting to closets. 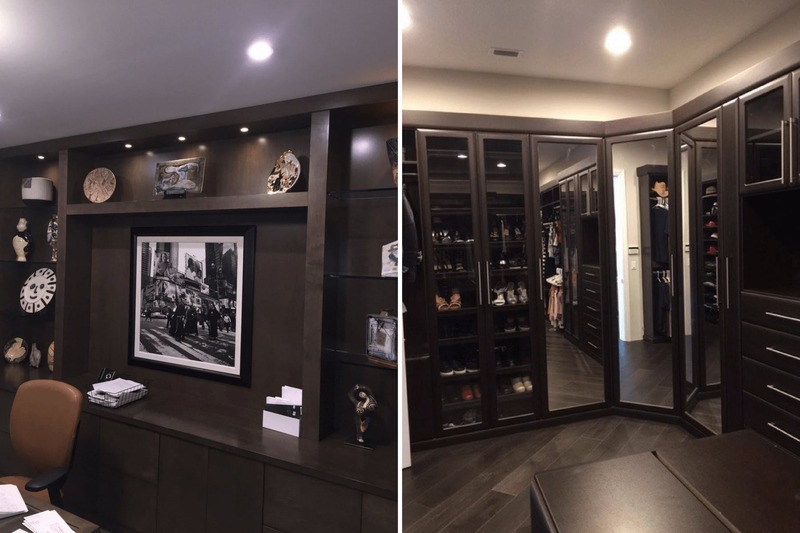 The flat 3 way mirrored cabinet below is illuminated by recessed lights in the extended top shelves that continued throughout the whole closet.